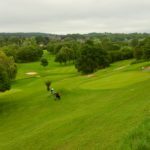 Wells Golf Club is a lovely park land course set just outside of Wells in Somerset which is the smallest city in England. The course is a nice mix of holes featuring challenging, undulating tight and open fairways. The back nine holes are flatter by comparison to the front nine. I also want to give a shout out to the Junior Club Captain who introduced himself and was friendly.